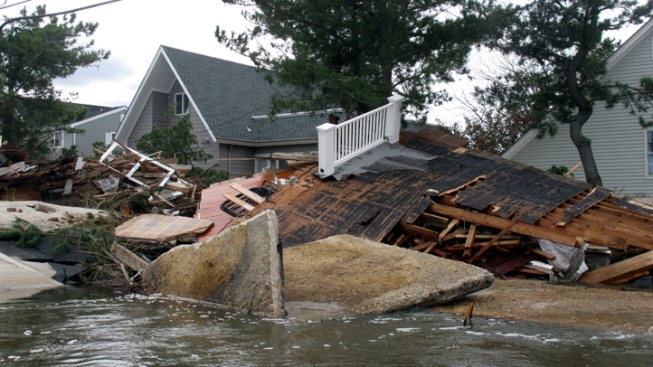 Water flows past debris from a destroyed home Wednesday, Oct. 31, 2012, in Mantoloking N.J.
New Jersey residents whose communities were hard-hit by this week's storm are being given extraordinary options to vote in Tuesday's election: They can drop by their county clerk's office all weekend to vote in-person and they can text a special number to find out if and where their usual polling location has been moved. Gov. Chris Christie said Friday that his administration is making sure residents have opportunities to vote, even if their polling station is without power or has been washed away. Christie said utility crews are working overtime to restore power to voting locations. But some residents will find National Guard trucks at their polling station, which will serve as makeshift voting booths. Residents will vote there on paper ballots -- "old school,'' as Christie put it. Lt. Gov. Kim Guadagno, who oversees elections, urged storm-ravaged residents to visit their county clerk's office between now and Election Day to cast their ballot in person. The clerks' offices will be staffed during business hours Saturday and Sunday accommodate storm victims. Guadagno says she expects few polling places to have to be moved. While she didn't have the complete list handy Friday, she said 10 voting locations in Monmouth County would be without power on Election Day. She said residents can text 877877 or log onto www.elections.nj.gov to find out where they can vote on Tuesday. In Newark, Essex County Clerk Chris Durkin said most of the county's 306 polling locations have power. He said no Newark residents would have to leave their ward to vote. 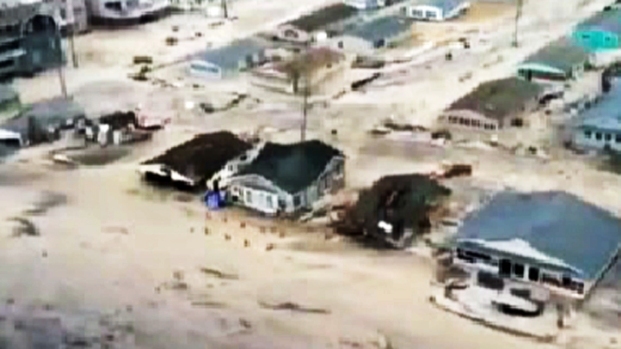 The Seaside Heights boardwalk sustained at least $7 million in damage from Sandy. A famous roller coaster was wiped out among other amusement park rides. Brian Thompson has the latest updates on storm damage along the Jersey Shore. He and Mayor Cory Booker are also urging residents to take advantage of early voting at the county clerk's office. Associated Press reporter Katie Zezima contributed reporting from Newark.